On day one of maternity leave, Mindy finds herself driven crazy by Danny's overcautious efforts to create a safe environment for their child. Morgan struggles to find a woman to love, while Mindy and Danny also meet their amorously noisy neighbor. 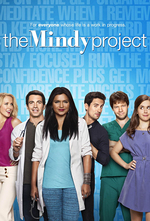 The Mindy Project can be found on Hulu.com every Tuesday. I was disappointed with this episode. I found it all over the place, even more than usual. I know it's always ridiculous, but it was all a bit too much. Mindy seems to be ditzier than normal, and it's starting to wear a bit thin. I am really hating this new season. I love Mindy and both of the 2 original seasons, but I can't help but feel she's without an editor in this new season on hulu. This definitely was the weakest episode of the new season. If we hadn't had Danny reading Mindy's diary in a previous season, his secret Nanny-cam on Mindy probably would have been way too over the top for intruding on her privacy. Not to mention, his lack of faith in her to be a good mother to their newborn. I would have appreciated more an acknowledgment that she's going to be just fine in the conclusion. I'm starting to wonder if this might turn into the Morgan and Mindy show. I feel like this show keeps trying to make us forget that Mindy is intelligent enough to hold a medical degree. Specifically, I feel like they're intentionally making her dumber, in order to provide justification for Danny's super-gross controlling behavior. At the end of every episode, we're supposed to think that Danny's learned his lesson and trusts that Mindy isn't a giant sack of stupid, but by the very next episode he's back to being the same controlling creep that he was in the episode prior. I feel like next episode is an improvement and Mindy receives some validation for her skills and ability as a doctor, but it also continues the theme of Mindy not quite being able to have that honest discussion with Danny, either. But that's more for next episode, than this. This episode may be the worst so far of the season.